When creating a sensational sunbird garden, it’s important to remember that sunbirds are drawn to the colour red, like a Spanish bull to a red cloth. Their beaks are long and curved; adapted to fit in trumpet-shaped flowers. 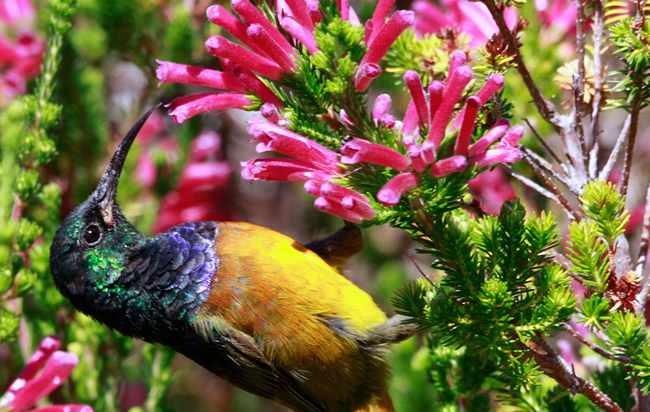 There are 21 species of sunbird in South Africa - two of which are endemic. They are wonderfully charismatic little birds to see in your garden, and the southern double-collared sunbird, the malachite sunbird and the dusky sunbird are all common urban garden residents in South Africa. 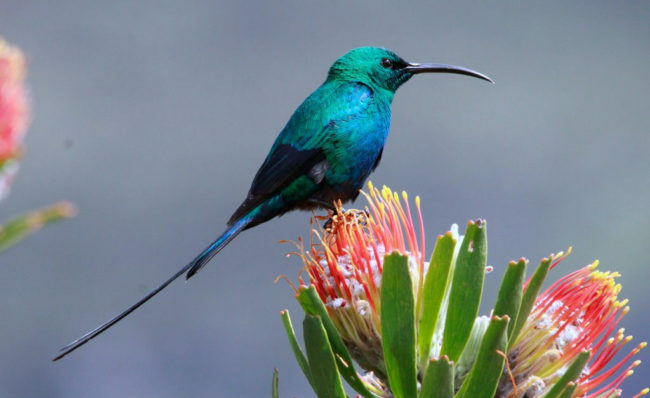 In the Gauteng region, the Marico sunbird, the greater double-collared sunbird, the white-bellied sunbird and the amethyst sunbird will also make appearances. It is important to understand in which biome your garden falls, and what type of sunbird you can attract. 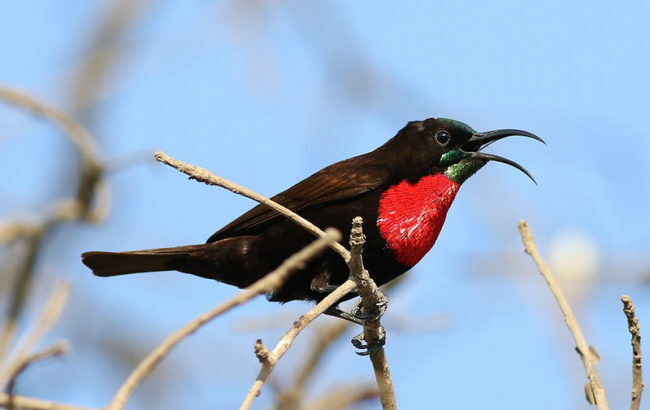 Some sunbird species are strictly bushveld specimens, while others prefer riverine forests. 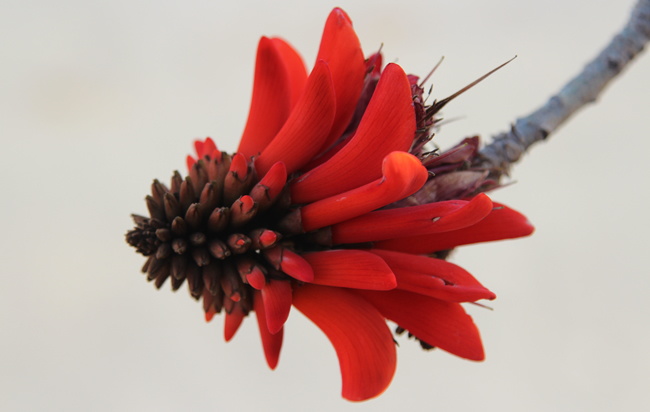 The flaming scarlet flowers of the coral tree are nectar-filled sunbird heaven. Erythrinas also make for a great bird tree in general. The ruby red blossoms of the weeping boer-bean make for a splendid sunbird-attracting specimen. This is a neat, low maintenance tree with a non-aggressive root system that makes it perfect for a frost-free garden. 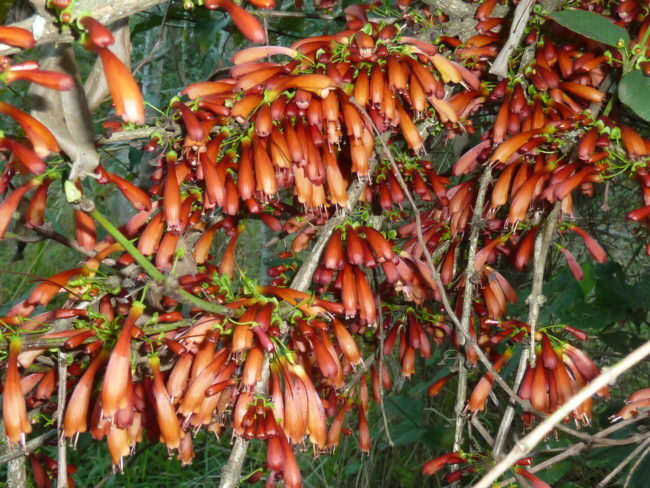 It gets its name because it practically spits nectar, which is loved by the sunbirds, butterflies and bees. 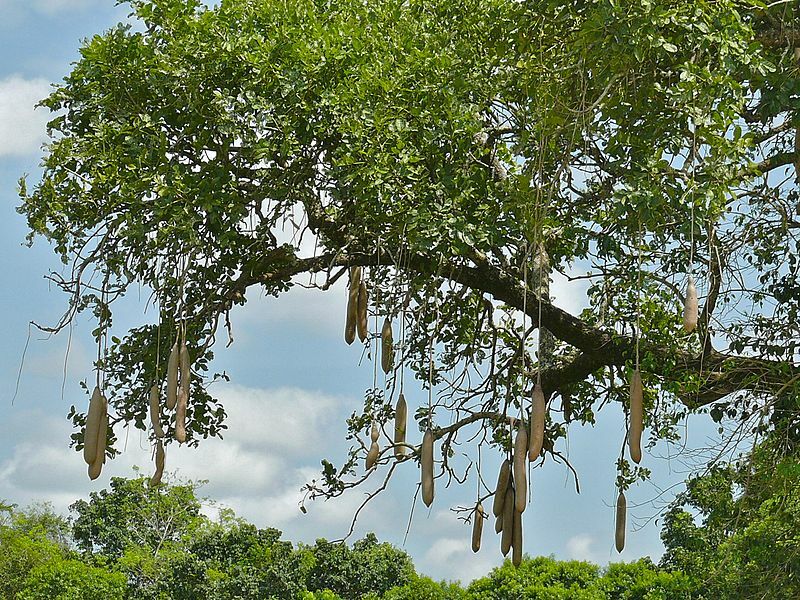 However, this characteristic doesn’t make it a good tree for a street or parking lot. The cork bush is one of the most underrated shrubs in the Highveld, but it offers multiple ecological services to hordes of insects and birds. This delightful lilac-flowering specimen is a neat tree for nectivorous birds like sunbirds, bulbuls and paradise flycatchers. Although the flowers are not red, sunbirds are known to visit the nectar-filled flowers of the Natal mahogany. This tall evergreen tree is also a hotel for throngs of other birds as it provides deep shade and sheltered protection. Its little blossoms are the colour of Fanta Pineapple and they’re full of sugar like the fizzy drink, which make them perfect for sunbirds! The crane-shaped flowers of the Natal wild banana are oozing with nectar. This tree has a palm-like effect and only grows on the Natal coast. The wild banana is a favourite of the olive sunbird. Other common sunbird species that occur in the Durban region are the scarlet-chested sunbird, the grey sunbird, the collared sunbird, the white-bellied sunbird and the purple-banded sunbird. The scarlet-chested sunbird is attracted to the blossoms of the sausage tree, which vary from maroon to blood red in colour. Most interaction between nectivorous sunbirds and plants tends to be symbiotic, but the scarlet-chested sunbird cheats by making a hole in the bottom of the flower and sucking the nectar out, instead of going through the corolla and assisting with pollination. The tree fuchsia is the ultimate tree for sunbirds. The crimson trumpet-shaped blooms hold a cocktail of nectar that means it is ‘Happy Hour’ for sunbirds from May to December. Bees and insects are known to also enjoy the tree’s fruit. 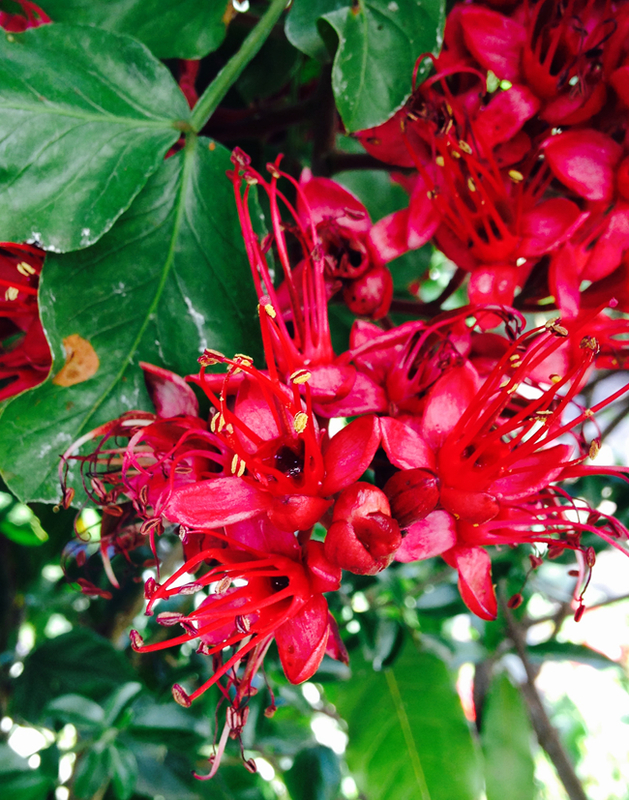 The tree fuchsia also attracts fruit-eating birds, click here to read more. A lot of sunbirds, especially juveniles, don’t just live off nectar, but they are known to eat insects and the sweet, sticky sap released by fig trees when they are stung by fig wasps. South Africa’s endemic greater double-collared sunbird and the southern double-collared sunbird both feed on fig sap, as well as the juice from the fruit, so plant a fig tree if you want to provide sunbirds with a delectable treat. Sunbirds like a place to bathe and have been known to dart through sprinkler systems, so some kind of water source will be bound to lure them in for a dip. You can also supplement your sunbirds’ sugar addiction by hanging a nectar-feeder filled with a sugar solution. To further attract the sunbirds, add beetroot dye to the solution or paint the bottle red. But be sure to clean the feeder regularly and do not use artificial red dyes. These delicate little birds are threatened by both domestic and feral cats. There is no point starting a sunbird garden if you are a cat lover. It is also important to note that cuckoo species are natural enemies of the sunbird because of brood parasitism.